I’m writing this edition of “Tony’s Tips” on Black Friday because, with the exception of going to our local Home Depot with my wife at 6 am in the morning, I spend the day safe inside Casa Isabella. The Home Depot trip is, for me, the equivalent of renewing our marriage vows. “How so?,” you foolishly ask? I accompany my wife to Home Depot at that ungodly hour so she can purchase as many ninety-nine-cent poinsettias as can fit into our shopping cart. That generally works out to anywhere from one to two dozen. In truth, it’s not the crowd or hour I find daunting. It’s those plants. Poinsettias. The Devil’s Flowers. The only actual plants that look like fake plants. I have hated this mostly crimson blot on nature for decades. And yet, because I love my wife, I go with her to Home Depot every morning after Thanksgiving. Hey, it’s cheaper than my going to Jared’s. There are better expressions of love, especially if one happens to be shopping for a devotee of comic books and strips. 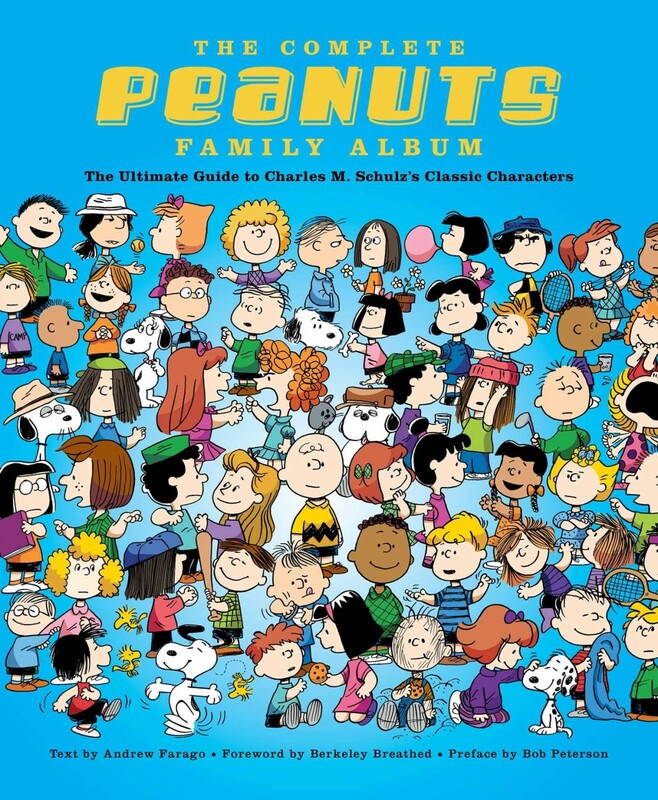 Case in point: The Complete Peanuts Family Album: The Ultimate Guide to Charles M. Schulz’s Classic Characters by Andrew Farago [Weldon Owen; $40] with a foreword by Berkeley Breathed and a preface by Bob Peterson. Weighing in at 3.4 pounds, this nine by eleven-inch hardcover is an amazing examination of Peanuts and its wondrous cast. Farago shines a light on the main characters and their world, but he also looks at more obscure characters. As I made my way through the book’s 256 pages, I would pause to squeal with delight as I spotted some long-forgotten bit player. Just as enjoyable was Farago’s explaining – through interviews with and quotes from Schulz – why those players faded from the strip quickly. Beautifully designed and filled with over 700 images, many of them rarely seen, The Complete Peanuts Family Album manages to be both an attractive coffee table book and an informative history of the legendary comic strip. You won’t learn everything you need to know about Peanuts and Schulz, but you will learn stuff that never made it into other Peanuts histories. The Complete Peanuts Family Album is my pick of the week. 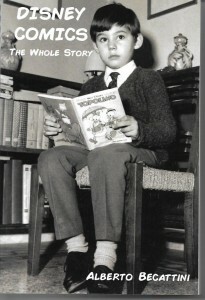 For the truly dedicated student of comics history, there’s Disney Comics: The Whole Story by Alberto Becattini [Theme Park Press; $39.95]. A high school teacher of English in Florence, Italy, the obsessive Becattini has been writing about comics, illustration and animation for over four decades. In this 466-page book, he delivers what the back-cover blurb promises: An Encyclopedic Reference of Disney Comics. Becattini’s detailed reporting on Disney comics from the very start of Disney comics to their growth in the United States of America and across the oceans is impressive. There so much information that I will be reading a portion here and a portion there. It’s the only way I’ll have a prayer of retaining so much Disney knowledge. If there’s a flaw in the book, it’s that its encyclopedic nature is not conducive to breezy prose. It’s more of a fact book/text book that a wild ride through the world of anthropomorphic ducks, mice and other critters. Don’t fret. This astonishing volume also covers Disney’s human characters and comics as well. My interest in overseas Disney comics and creators has been growing since I did a short stint rewriting various foreign Disney stories for the American market. Even now, when I peruse the huge database of Lambiek Comiclopedia, I keep a close eye out for Disney writers and artists. Especially the Italian writers and artists. Before I come to the end of my comics-writing life, I’d really love to work directly with some of my talented landsmen. This is not a gift suitable for the casual comics fan or historian. However, if the subject is one in which a fan or historian already has an interest, you won’t find a better reference book for them. It earns my recommendation. To wrap up this week’s column, let’s talk in general terms about a favorite comic book of mine: Champions [Marvel; $3.99 per issue]. Decades ago, I conceived of a comics series by that title that, by the time the editors had their way, went from a super-hero buddies road trip book starring Iceman and the Angel to an unwieldy team of “super-heroes for the common man” based in Los Angeles. Fans tell me they loved it. I can see why. But I’ve always been disappointed that I never really brought home that lofty concept in the manner I would have liked. Imagine my delight that Mark Waid, one of the best writers in comics, is doing such terrific comic books with a concept not unlike the one I conceived. Former Avengers Ms. Marvel, Nova and the Miles Morales Spider-Man walked away from the senior team because they became disillusioned with how the adults were running things. As with so many super-hero titles, the heroes spent more time fighting their old enemies than helping people. Joined by the Hulk (ala Amadeus Cho), a time-tossed young Cyclops and Viv Vision, the teen teammates are determined to focus on helping people. There have already been a dozen issues of great Champions comic books with no end in sight. One of the adverse side effects of the Marvel Universe is that its titles get swept up into whatever massive (and usually awful) epic that promises to change the Marvel Universe forever. Such epics are a drug-free substitute for sleeping pills. I dislike them and wish Marvel would stop doing them. Champions #11 [October 2017] was a tie-in to the recent repugnant Secret Empire event which saw Captain America transformed into a murderous Nazi. How murderous? He destroyed Las Vegas to show what a total boss he was. In that issue of Champions, Waid with penciler Humberto Ramos, inker Victor Olazaba and colorist Edgar Delgado showed us the horrific aftermath of the obliteration of Las Vegas. It was as brilliant as it was horrific and, to be honest, left me wondering if the Marvel Universe could ever be set to rights again. Couldn’t we have an issue where the real Captain America steps out of a shower and Sharon Carter tells him she just had the most awful nightmare? I’d suspend my disbelief for that. Champions #12 [November 2017] was a breath of fresh air after the previous issue. It’s a solid done-in-one issue with the teen heroes battling Psycho-Man, not because he’s some old foe of theirs, but because he’s putting people in jeopardy and they need to stop that. I loved it. 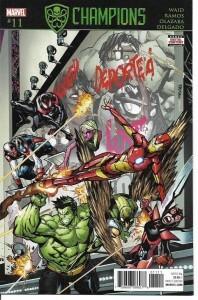 Currently, Champions is crossing over with Avengers in a six-issue series alternating between the two titles. While it’s interesting to see the senior team proving the younger team was absolutely spot on to go its own way, it’s not as pleasing as the Champions doing their own thing. It’s not a bad story. It definitely has some cool moments. I’m just tired of crossovers large and small. The first six issues of Champions have been reprinted in Champions Vol. 1: Change the World [$15.99]. The next several issues will be reprinted in Champions Vol. 2: The Freelancer Lifestyle [$19.99], which is due out before the end of the year. And, if you’d like to see the original Champions comic books, they have been collected in Marvel Masterworks: The Champions Vol. 1 [$100] with an fun-filled introduction by me. Each and every one of these fine volumes would make an excellent Christmas or holiday gift for the comics fan you love or for yourself. It’s Thanksgiving week and I’m thankful that, as I lumber toward my 66th birthday, I still have fans and friends reading what I write and, one hopes, enjoying what I write. Of course, there are other things for which I’m profoundly thankful. My family. That I’m again writing Black Lightning comic books. That the Black Lightning live-action TV series will be debuting on the CW on Tuesday, January 16, 2018. Blessings abound. I’m also grateful that, some 62 years from when I learned to read from comic books, I am still an avid fan of the medium. I read way more comics and collections and graphic novels than I can fit into this column or my nigh-daily blog. But, when I come across comics that are great or comics that, though not necessarily good, spark a review, I’m so pleased to have forums like this one wherein I can share my comments with you. Let us have at it. I’ve got it bad for the PS Artbooks hardcover collections of public domain comic books. Even when I suspect the material won’t be very good, I am drawn to the opportunities to read comics I would likely never not been able to read any other way. 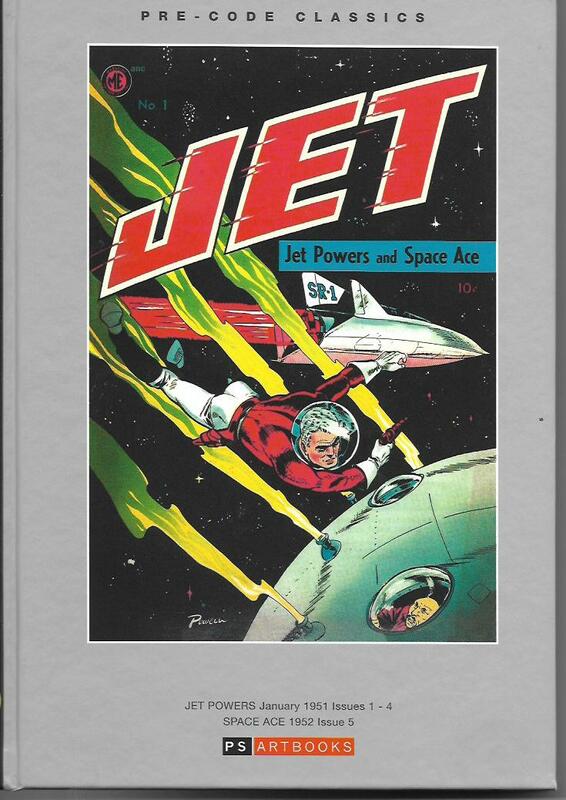 Pre-Code Classics: Jet Powers/Space Age Volume One ($44.00) brings us five science-fiction comics. Originally published by Magazine Enterprises, Jet Powers #1-4 were published in 1951. That numbering was continued with the one-shot Space Ace #5, originally published in 1952. Drawn by Bob Powell, Jet Powers is a “captain of science, master of the atoms and molecules that make up the world we live in!” He’s a bonafide super genius and his sci-fi adventures involve the usual mad scientists and would-be alien conquerors. Each issue has three Jet Powers stories. Each of the four issues also presents a short comics story of Space Ace, a star adventurer and pirate. Lawrence Woromay drew the first Space Ace tale, the artist of the second has yet to be identified and the stories in #3 and #4 are penciled by Al Williamson with, on the last story, some inking assistance from Wally Wood. The most interesting of the Jet Powers tales are those in which the humans of Earth are almost completely wiped out by “The Dust Doom.” This story continues in a later issue, next to Jet Powers stories that don’t seem to be part of that continuity. It’s jarring, but I like the audacity of the storyline. Space Ace #5 isn’t nearly as interesting. Gone is the adventurer and pirate, replaced by a generic super-hero sort with a teenaged sidekick. There are five short Space Ace tales, all drawn by Fred Guardineer in a dull, flat style. Jet Powers/Space Age Volume One is mostly pretty fun. If you love 1950s sci-fi comics, you’ll enjoy this book. I can’t recommend Marvel’s Bloodstone and the Legion of Monsters [$34.99]. The book collects the four-issue Legion of Monsters from 2011, some short Elsa Bloodstone stories from various specials and the original Ulysses Bloodstone series from Marvel Presents and the back pages of The Rampaging Hulk. 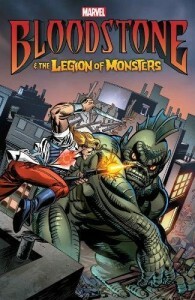 The Legion of Monsters mini-series by Dennis Hopeless with artist Juan Doe is terrific. Elsa is an edgy and fun heroine and I loved her interactions with her monstrous uneasy allies. While the 2012 trade paperback is out of print, you can easily find copies on the secondary markets. Get that trade paperback and you have the best part of the larger collection. What really brings the book down are those original adventures of Ulysses Bloodstone. While some of the art is interesting and even well done – I like the teaming of American pencilers with finishers from the Philippines – the writing on these stories is pretty bad. The stories meander all over the place. The captions and dialogue are leaden. The only interesting one in the bunch is the finale of the series. That finale was written by Steve Gerber, possibly recruited to put this suffering animal out of its misery. Gerber’s script takes no prisoners and is not kind to Ulysses. It’s nowhere near one of my sorely missed friend Steve’s comics masterpieces, but I confess I enjoyed his approach to wrapping up the series. If the Legion of Monsters limited series was only available in this just-released larger collection, I would probably suggest you get it and stop reading before the 1970s Bloodstone stuff. But you’ll save yourself time and money by going for the 2012 trade paperback mentioned above. This week’s pick of the week is Fresh Romance Volume 2, edited by EMET Comics publisher Maytal Gilboa [$24.99]. The 192-page volume presents four fine stories of LGBTQ and interracial romances: “The Only One” by Cecil Castellucci, Sarah Winifred Searle; “Under the Oak Trees” by Sally Jane Thompson; “Walk It Off” by Suzana Harcum and Own White; and “One Lucky Bride” by Julie Hutchinson. “One Lucky Bride” is a madcap comedy of errors about a lesbian who must get married by a certain deadline in order to inherit wealth. “Under the Oak Trees” deals with a long-distance romance. “Walk It Off” is an adventure/travel romance that will be continued – soon, I hope – in a future Fresh Romance volume. All of them are charming and entertaining stories told without cynicism and with an eye on the happy ending prize. “The Only One” is the shortest tale in this anthology, but it’s my favorite. It’s the story of a romance that is literally a lifetime in the making. Romance is not just for the young. That is a theme that resonates with someone of my advanced years. 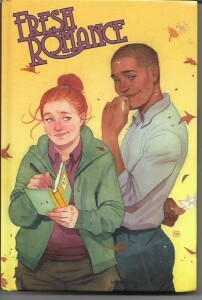 Fresh Romance Volume 2 will be of interest to the readers who love romance comics, who love human tales and who love to see diversity in comics. It would make a great gift for a romantic partner who shares your love of comics or one you want to introduce to the joy of comics. I’ll be looking for more EMET publications in the near future. I’ll be back next week with more comics tips. This is the kind of week I like best. Three reviews and every one of them is a pick of the week. 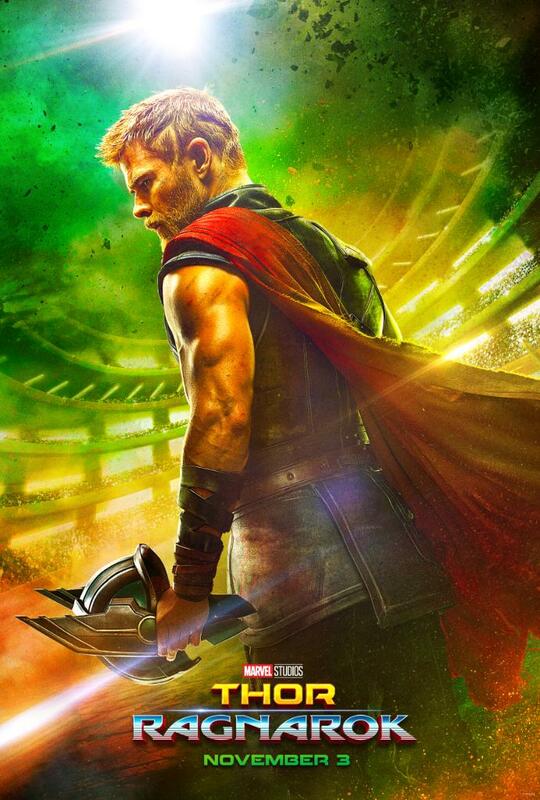 Thor finds himself in lethal gladiatorial contest against the Hulk, his former ally. Thor must fight for survival and race against time to prevent the all-powerful Hela from destroying his home and the Asgardian civilization. The movie kicks off with Thor venturing into the fiery depths on a mission to subdue the fire demon Surtur and so stave off the coming of Ragnarok. But the return of Thor’s forgotten sister Hela brings that prophesied destruction of Asgard ever closer. Odin is dying. Thor and Loki end up on a distant planet. Hela conquers Asgard and, by the time the Odin sons and their allies reach Asgard, Hela has already slaughtered most of Asgard’s defenders and appointed Skurge as her executioner. Thor: Ragnarok is a dark film. Despite that, it has considerable humor, terrific performances, thrilling action, great character play and a heroism that offers the viewer hope no matter how dire the circumstances might appear. There are life-changing moments for several characters and not one of those moments feels forced. It’s what we have come to expect from Marvel Studios: an epic adventure true to its comic-book roots. On a personal note, I was pleased to see Larry Lieber’s name next to Stan Lee and Jack Kirby, recognizing his role as the writer of the first Thor comic-book story. I couldn’t catch every one of the other acknowledgments and special thanks given to comics creators in the end credits – there were many of them – but I applaud Marvel Studios including these in its movies. If you have enjoyed previous Marvel Studios films, I think you’ll enjoy Thor: Apocalypse. Every time I see a new entry in the series, I want to sit down and watch all of them again. That would make one heck of a fun vacation week. 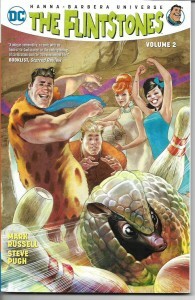 The Flintstones Volume 2 by Mark Russell with artists Steve Pugh, Rick Leonardi and Scott Hanna [DC Comics; $16.99] is every bit as good as the first volume, which I lavished praise upon just a few months back. The witty Russell brings the modern stone age family face-to-face with today’s national and global concerns. Corporate greed and the lack of empathy for workers. Bogus religion used to promote base agendas. Demonizing the other to feed the war machine as a matter of political policy. Exploitation of minorities, which, in this series, are mostly animals pressed into service as bowling balls and appliances. Insane consumerism. This is hilarious comedy with a thoughtfully chewy core. This trade paperback reprints issues #7-12 of the limited series. A dozen issues of this fresh new take on the classic Flintstones cartoon aren’t enough. If Russell gets a second wind and wants to write more, I’ll buy them. The Flintstones Volume One and Two are recommended to the grown-up kids of my generation who can accept a different vision for these beloved characters. They are also recommended to somewhat younger readers who have enjoyed the cartoons in their constant reruns on various cable networks. Consider them as holiday gifts for members of either group. They are yabba-dabba-awesome! 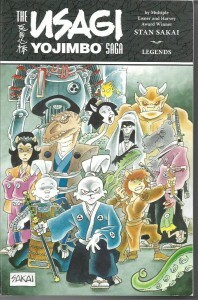 The Usagi Yojimbo Saga: Legends by Stan Sakai [Dark Horse; $24.99] breaks from the issue-by-issue reprinting of the great comic-book series to collect stories that took place outside Usagi’s ongoing timeline. It starts with the entire run of Space Usagi, a science-fiction series that took our samurai hero to a galaxy far far away. Sakai brought a “Star Wars” vibe to his classic characters with the result being a stunning thriller. Also include in this volume is the full-color graphic novel Yokai, a wild monster mash featuring Usagi in battle with a legion of demons and monsters; and a bevy of cool bonus features. However, for me, the best story in this collection is the six-issue Senso. Imagine if the Martians from War of the Worlds had landed on Earth centuries earlier. Not in London, but in Japan’s Edo period and in the midst of a climatic battle between the warring factions of that time. It’s one of my favorite Usagi Yojimbo adventures of all time. I recommend all of the Usagi Yojimbo collections from Fantagraphics and Dark Horse. As I’ve said, I consider Sakai our greatest living cartoonist. A gift of any of these volumes to those special comics readers in your life will introduce your loved ones to some of the finest comics work ever created. They’ll thank you for that. That’s all for this installment of Tony’s Tips! I’ll be back here next week with another trio of reviews. Normandy Gold [Titan Comics; $3.99] is a hard-as-nails crime comic book with a heroine who is even harder. Written by Megan Abbott, an Edgar-winning author of seven crime novels and writer/journalist Alison Gaylin, this comics series is drawn by the remarkable Steve Scott. By way of full disclosure, Scott is a good friend of mine. But I’m also an admirer of his work and it was his name that led me to Normandy Gold. Sheriff Normandy Gold comes from a broken family, but was raised by a lawman. She followed him into the profession. This series opens with her receiving a phone call from her half-sister Lila, living in our nation’s capital. The initially happy conversation takes a dark turn when Lila is murdered as Normandy listens. The sheriff is in Washington D.C. a few pages later. Set in the 1970s, this is a thriller of politics and prostitution. The D.C. police don’t have much interest in investigating the death of a call girl – there are so many of them in the city – but Gold will go to extreme lengths to find her sister’s killer and deal out some justice to him. The situation turns out to be a heck of a lot more complicated than Normandy imagined and with tendrils reaching upward to the highest levels of power. I have the first four issues of Normandy Gold. The characterization of the sheriff is powerful and scary. There are scenes that shake her and the reader. Adding to these moments and the overall story is Scott’s sure storytelling and excellent depictions of the era in which the story is set. I’m hooked. Normandy Gold is my pick of the week. A trade paperback collecting the series [$19.99] will be published in March. Even though I have (or will have) all of the individual issues, I plan to buy a copy of that book. Though diminished by the Captain Hydra Steve Rogers nonsense – and nothing in that ridiculous event has changed my microscopically low opinion of it – the Captain America Sam Wilson title told a number of interesting stories that touched on the political issues of the real world. While all of those stories could have been told without the Captain Hydra stuff, I applaud them nonetheless. Knowing that Sam Wilson would almost certainly resume his role as the Falcon, I was eager to see what Marvel would do with him. 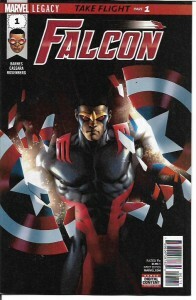 Falcon #1 [$3.99] has Sam trying to figure out what kind of a hero he wants to be. Screenwriter and producer Rodney Barnes has credits ranging from The Boondocks to Marvel’s Runaways. He’s also earned a number of top honors for his work. In this initial issue, Falcon is trying to broker peace between warring Chicago street gangs. It’s good premise, torn from reality, as it were, but it’s weakened by a couple clunky speeches and the last page introduction of a surprise fantasy element. Additionally, I’m not completely on board with the Joshua Cassara art. It’s kinda stiff in some scenes and way too shadowy in others. I’m not giving up on Falcon. I like Sam Wilson too much for that. I also want to see where Barnes goes from here. My hope is that he doesn’t pin the folly of man on the supernatural. 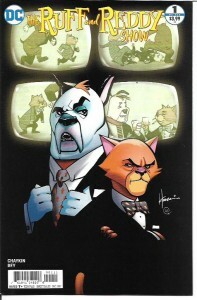 The Ruff & Reddy Show #1 [DC; $3.99] was a definite contender for this week’s pick of the week. Writer Howard Chaykin weaves a cool almost biographical tale about a world where humans coexist with and, naturally, discriminate against the very cartoon characters who entertain them. Ranging across a couple decades, we meet the team of Ruff and Reddy, a clever cat and somewhat less clever dog, who, despite the success they achieved together, hate each other. The enmity is the push that leads to the downfall of their careers. Chaykin has a knack for writing the 1950s and 1960s. He knows his history and, in this first issue, there are echoes of those real-life entertainers who fell from grace. Artist Mac Rey illustrates the issue in a style that reminds me of the more “hip” cartoons of the 1960s. It’s a classy look for an intriguing story. I was skeptical of DC placing beloved animated characters in this more realistic and serious world. Especially when it came to Ruff and Reddy, two of my own childhood favorites. However, with a rare exception, I’m getting a kick out of these titles. They may not be the characters as I remember them, but, as long as they challenge and entertain me, I’m on board with them. One more note for this week. Black Lightning: Cold Dead Hands #1 is now on sale and has debuted to almost universally terrific reviews. Artist Clayton Henry is doing an amazing job on the series, as is colorist Pete Pantazis. Editor Jim Chadwick gives me better notes than almost any editor I’ve ever worked with in my 45 years in the comics biz. Everyone at DC, including management and publicity, is giving this series tremendous support. I’m as proud of this series as anything I’ve written. Which is my long-winded way of saying I hope you’ll give the series a look.